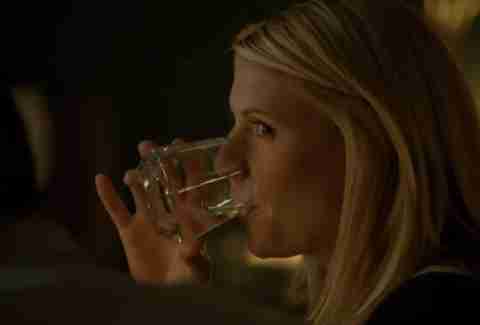 Over four seasons, Homeland has become known for its tense standoffs, excellent use of Inigo Montoya, and complicated heroine -- who's expressed a fondness for wine rivaled only by Olivia Pope. 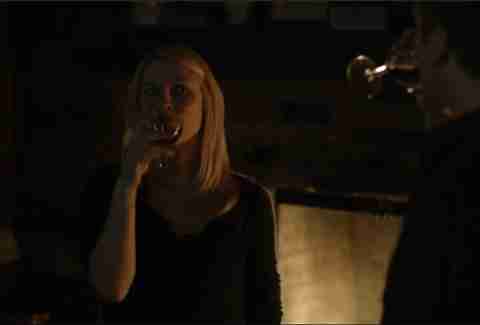 But is Claire Danes' Carrie Mathison a strictly white wine-and-jazz kind of girl? Or is she into more boozes than the countless Internet parodies would suggest? Ahead of the season finale, we investigated everything she's imbibed in 47 episodes. Turns out she is more varied than we give her credit for, though she certainly has her standbys. Check out her complete bar tab below, but keep an eye out for that SOB Haqqani as you scroll. Carrie's first onscreen drink happens when she's on one of her many bar prowls -- signaled by her sparkly shirt and fake engagement ring. But weirdly, she opts for some brown stuff on ice, which we'll learn is pretty outside her usual boozing habits. Then again, we'll also learn that erratic behavior is kinda Carrie's thing, so we guess it makes sense. Season 1, Episode 4 -- "Semper I"
That's more like it. At a coworker's birthday party, Carrie sips a glass of her signature white wine. We also get some key backstory on her and David during this scene, but we were mostly left wondering how one crashes a CIA birthday party. 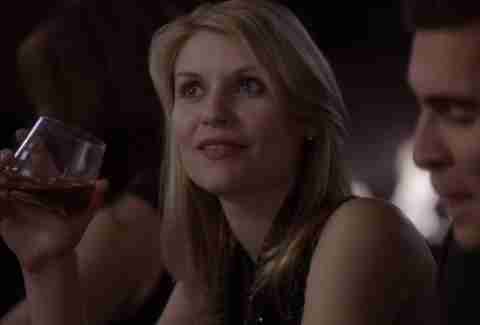 Season 1, Episode 5 -- "Blind Spot"
When she runs to her sister's place in a moment of panic, Carrie is greeted with a glass of red. Apparently it wasn't very good, because she cuts out later in the middle of the night. Season 1, Episode 6 -- "The Good Soldier"
In the first of many boozy scenes together, Brody and Carrie swap bourbon shots. (His liquor choice.) They also have their first lengthy conversation, which is impressive, given Brody's ridiculously tiny mouth. Season 1, Episode 7 -- "The Weekend"
Though she never gets to drink the Tequila Revolucion Silver that Brody orders her at the dive bar in this episode -- pesky neo-Nazis! -- we can assume Carrie had a few before the pair hightailed it outta there. And we know she took some slugs from the pint of unidentified clear liquor Brody brings along for their weekend cabin getaway. 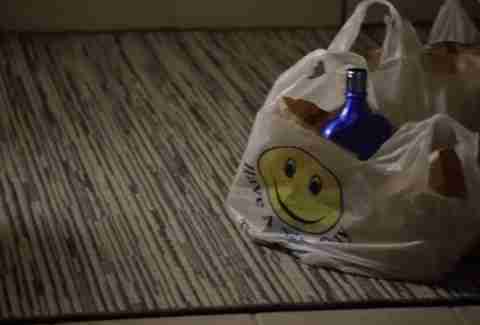 Season 2, Episode 3 -- "State of Independence"
Now for a dark one: Carrie drinks all that wine to wash down the fistful of pills she swallows in a suicide attempt. We're just glad she changed her mind and puked them up. And that David finally let her back into operations soon after. Season 2, Episode 4 -- "New Car Smell"
This is an educated guess, as Brody never indicates what he ordered Carrie when she goes to meet him at his hotel's bar. But given that it's clear booze, and there seems to be some knowing acknowledgment of whatever he chose, it's probably the tequila that Carrie asked for at the dive bar. Thankfully, there are no neo-Nazis this time to kick them out. 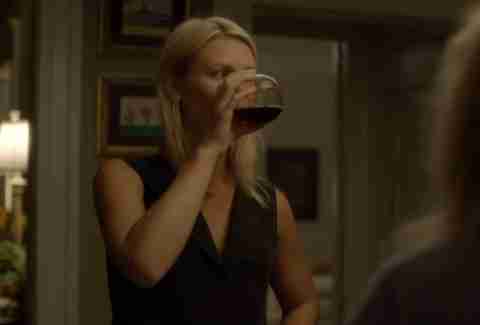 Season 2, Episode 5 -- "Q&A"
More of Carrie pouring herself some white wine, as two teenage idiots embark on the dumbest Homeland plotline in show history across town. Season 2, Episode 12 -- "The Choice"
Well, it was a nice moment while it lasted. Carrie and Brody open up a bottle of red during a return trip to the cabin and get all cozy, only things fall apart at an alarming speed when they attend a funeral later in the same episode. Let's just say it is nothing like Weekend at Bernie's. Season 3, Episode 1 -- "Tin Man Is Down"
Carrie's Dad lets it drop early in the episode that he noticed bottles of tequila in her recycling bin. And she confirms this habit later when she picks up at least five bottles (and a ginger dude) at her nearby liquor store. Judging by the contents of the bag when they cut to Carrie later, she and the ging did some serious damage to the original supply. Season 3, Episode 4 -- "Game On"
Looking to score a few bucks after her bank accounts are frozen, Carrie smiles her way into that same dude's apartment three episodes later. She also apparently accepts a beer or two before bailing early the next morning with most of his cash. Better luck next time, bro. Season 3, Episode 5 -- "The Yoga Play"
Obviously, the only way to unwind after an ironically stressful yoga-themed operation is with a glass of straight tequila. Season 4, Episode 1 -- "The Drone Queen"
Season 4, Episode 3 -- "Shalwar Kameez"
... And she's back to the old classic again just two episodes later. 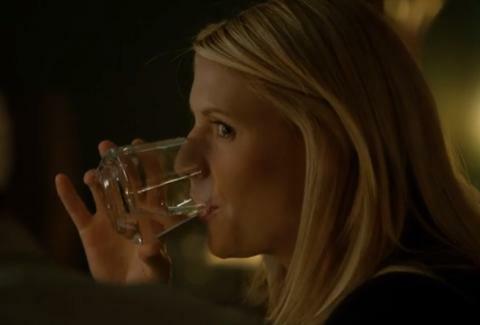 There's still one more episode left this season, so tune in Sunday to see what Carrie sips -- and if she, you know, gets that bad guy -- at 9pm on Showtime. Kristin Hunt is a Food/Drink staff writer for Thrillist, and would probably trade her firstborn for a hug from Saul Berenson. Follow her to Mandy Patinkin fan clubs at @kristin_hunt.